The current world is revolving around the idea of getting a decent job and when one catches a job, he or she generally is not happy with the job. We all go through the dilemma. But, to change jobs one need to make the best impression on the first meeting with the potential employer. The first interaction is done through Resumes. According to last year survey done by Gallup, which covered 230,000 full-time and part-time workers and concluded that only 30% of the group size are happy with their job. The percentage of people who hated their job hovered around 25%. The noting point is that the percentage of people not liking their job is very high. And to help our readers to make the best out of their first interaction with the Employer, we are listing the best 20 resume templates in Microsoft Word. For most of us, the resume can be just another paper, but for the employer it is the new whole world. According to another popular statistics, the human resource executive/manager only spend 6 sec to get an impression from a resume. If the resume fails to impress the manager, you are out from the race on the very first 6 sec. Another question that must be answered is whether using resume samples are morally right thing to do. The answer can be both yes or no. Creating a resume from scratch takes time and commitment and you have to keep lots of small details in mind to come up with a pixel perfect resume. How to choose a right template? Choosing a right template from the plethora of templates out there is a tough job. But, considering the following point will help you narrow down your search. 1. Consider the industry for which you are going to work for. Example, you want to work in IT sector. 2. After narrowing down on the industry, narrowing further down on what job you are looking for, makes the whole equation simpler to solve. For example, a designer portfolio should showcase his/her visualization and design thinking with an online portfolio. 3. Further, narrow down on your specific skills. Always choose a resume that can highlight your key skills and recent projects. 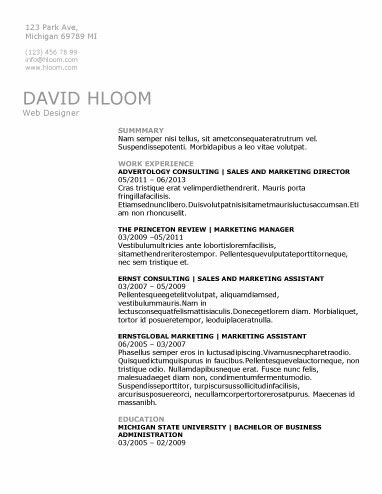 Let’s list 20 best free resume templates for Microsoft Word. All the resume listed here are handpicked and are categorised randomly to suit the users best needs.